Domus, the leading provider of tiles to the commercial sector, has broadened its portfolio with an interior natural wood flooring collection, launched at its new and exclusive Domus Wood Studio in Battersea this week. The striking new range of engineered timber is fabricated from European White Oak, renowned for its strength, quality and sustainability, and will offer architects and developers an exceptional new quality product for their projects. The Domus Wood Studio was designed by award winning concept and brand designer I AM and architect Mailen Design, which together have produced a high quality, designer space where visitors can explore the numerous shades, formats and finish treatments of the new wood collection. It sits alongside Domus’ existing, extensive tile range in Battersea and adds to Domus’ product showcases in London W1 and Clerkenwell. Domus has already been appointed to install its new Parquet Collection flooring in all 850 apartments of Battersea Power Station. This major regeneration of one of London’s most iconic landmarks has been designed by dRMM and Ian Simpson Architects, with the apartments designed by award-winning interior designer Johnson Naylor. Completion is expected in 2016. 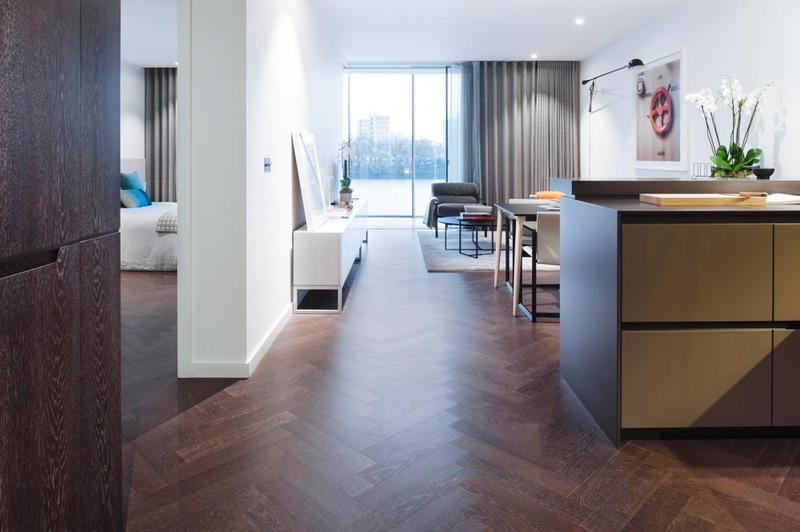 Pre-finished engineered oak herringbone flooring will feature throughout the apartments in the entrances, kitchens, living rooms and bedrooms in combination with Domus’ large format porcelain tiles and mosaics in the bathrooms. The wood has been finished and protected with the latest technology to ensure high performance standards of durability, water resistance and stain protection. Jon Newey, CEO at Domus says: “We pride ourselves on precision specification, speed of response and exact execution. We have for decades been providing tiling solutions to architects and developers alike, so offering a wood collection is a natural progression. We’ve invested in an exciting new space for the new collection allowing clients to source what they need from under one roof. “Our appointment on Battersea Power Station is testament to our approach and we’re excited to see our new product in the finished apartments and many more projects to come,” he added. The Domus Wood range is FSC® 100% certified. FSC® is the Forest Stewardship Council®, an international organisation dedicated to promoting responsible management of the world’s forests. It has also been installed at the redeveloped, world-famous Foyles book store, where an engineered oak floor covers the new areas including the entrance lobby, book aisles, stairways, lift areas, café and exhibition spaces. The scheme was designed by Lifschutz Davidson Sandilands.